On 10 July 2010, ESA's Rosetta spacecraft flew past the large main belt asteroid (21) Lutetia at a distance of about 3170 km. The spacecraft's trajectory carried it over the asteroid's illuminated north pole, enabling more than 50 per cent of the surface to be studied. The unprecedented images returned by the OSIRIS imaging system enabled the Rosetta science team to identify seven distinct topographic and geological regions, which were named after provinces of the ancient Roman Empire: Baetica, Achaia, Etruria, Narbonensis, Noricum, Pannonia and Raetia. The unobserved area of the southern hemisphere was named after Hermann Goldschmidt, who discovered asteroid Lutetia in 1852. 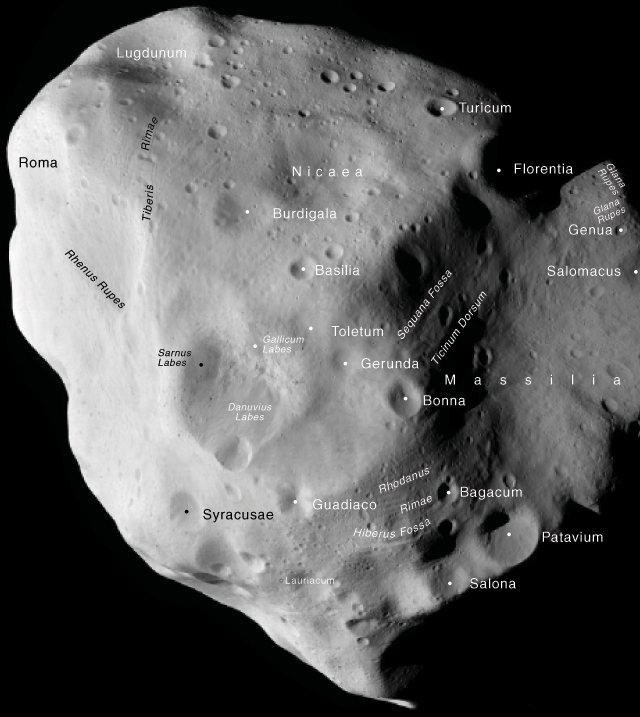 The most notable impact craters were named after cities which existed around the same time as the city of Lutetia (the Roman name for Paris, France). The largest of all is the 55-km diameter Massilia, the Roman name for Marseille. Other features have been named after rivers of the Roman Empire and adjacent parts of Europe at the time of Lutetia.